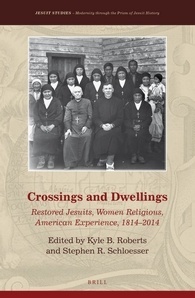 The newest addition to the Jesuit Studies book series at Brill is Crossings and Dwellings: Restored Jesuits, Women Religious, American Experience, 1814-2014. The volume emerged from a 2014 conference at Loyola University Chicago, held on the 200th anniversary of Pope Pius VII’s restoration of the Society of Jesus. It is edited by Kyle B. Roberts and Stephen R. Schloesser, S.J., both of the history department at Loyola University Chicago. Crossings and Dwellings contains a foreword by Michael Garazini, S.J., an introduction by Roberts sand Schloesser, an afterword by Thomas Tweed, and eighteen articles. The full table of contents appears below. Edited by Kyle B. Roberts and Stephen R. Schloesser, S.J. Kyle B. Roberts and Stephen R. Schloesser, S.J.